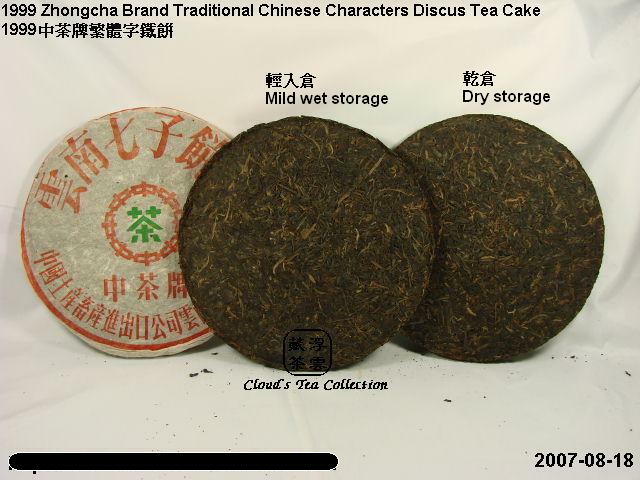 No matter of what versions of Xiaguan Zhongcha Brand Yunnan Seven-son Tea Cakes are, whether it is a "discus tea cake with nails and no hollow"" or a normal "tea cake with a hollow and compression imprint, both these versions are named in the Chinese Puerh tea market as "Discus Tea Cake" or "Iron Tea Cake" (I do not agree with the latter translation because there is nothing to do with "iron" except its hardness, although literally the Chinese character used to describ these kinds of tea cakes does mean iron). These Xiaguan Zhongcha Brand Yunnan Seven-son Tea Cakes have two versions from different stages, i.e. the "Simplified Chinese Characters" (SC) and the "Traditional Chinese Characters" (TC). As you may notice from the descriptions in the pictures, the SC was produced from the 1970's while the TC was produced from 1980's until now. It is a basic knowledge that the SC came earlier than the TC. In other words, all the genuine SC must be produced before mid-1980's. However, the TC have 1980's and 1990's versions, and even some 2000's versions. For details, you may refer to another Internet article 2006-02-07 1970's Simplified vs Traditional 2006 from [Cloud's Tea Collection - Internet Articles]. Amoung those tea cakes wrapped by the same Simplified Chinese Characters wrapping paper, we can still differentiate two different kinds of SC with regard to their compression shapes. 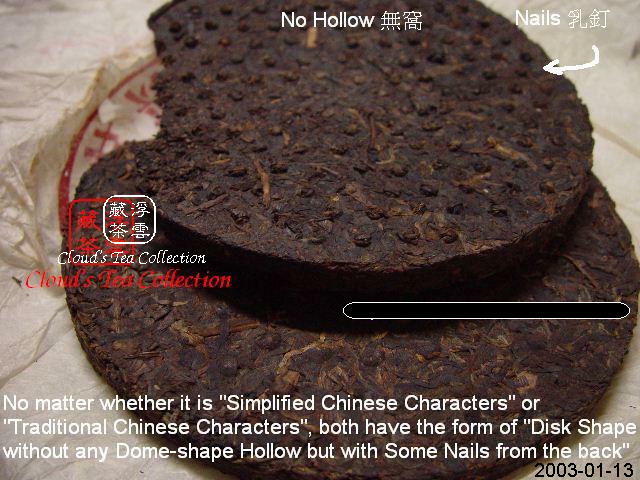 One is a "discus tea cake with nails and no hollow". 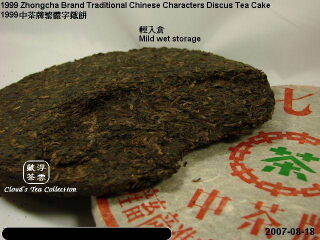 Another one is a normal "tea cake with a hollow and compression imprint. Both of these shapes of tea cakes were once wrapped by SC wrapping papers. 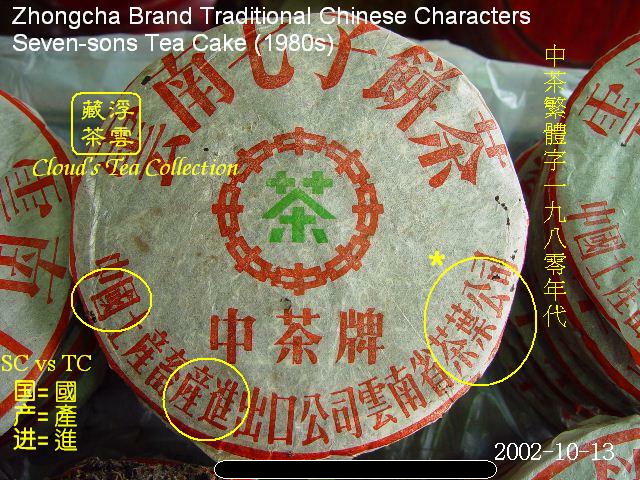 By judging the years of production of the wrappers, the market concludes that those SC tea cakes, no matter of what shapes they are, came from the same production stage of the Small Yellow Mark Seven-son Tea Cake, i.e. the 1970's. 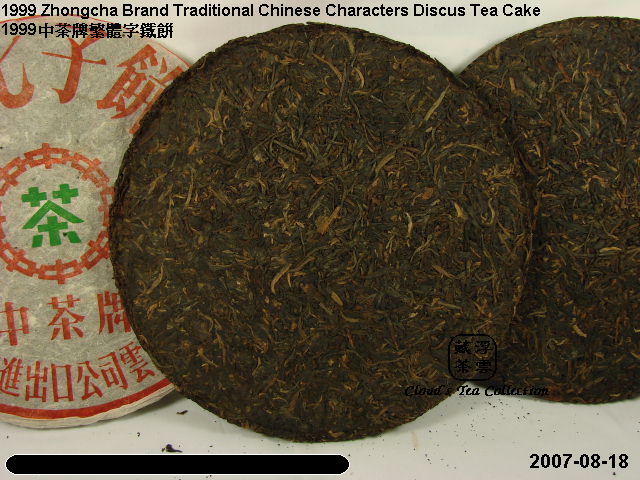 If you have both the "SC Tea Cake" (normal) and the "SC Discus Tea Cake" in front of you, you may wonder which one came earlier. 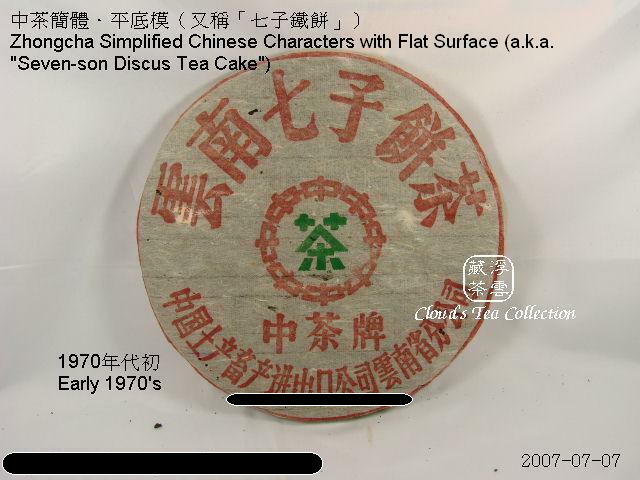 According to the recollection of some old tea vendors and few internal tea factory's records, the market has a unanimous view that the "SC Discus Tea Cakes" were the earliest tea cakes produced in the 1970's. The market names them as "Zhongcha Simplified Chinese Characters with Flat Surface (a.k.a. 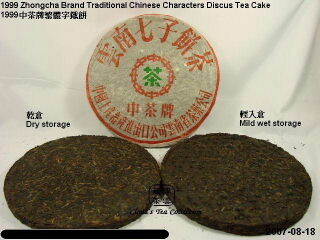 Seven-son Discus Tea Cake)". [More related photos: A0305 ~ A0313]. 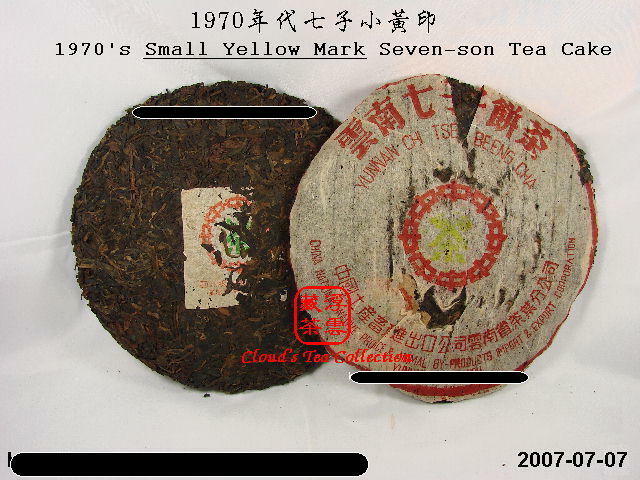 Generally speaking, because of the poor storage conditions of these "Seven-son Discus Tea Cakes" in the 1970's and 1980's, those beautiful and gorgeous remains are very rare to locate. 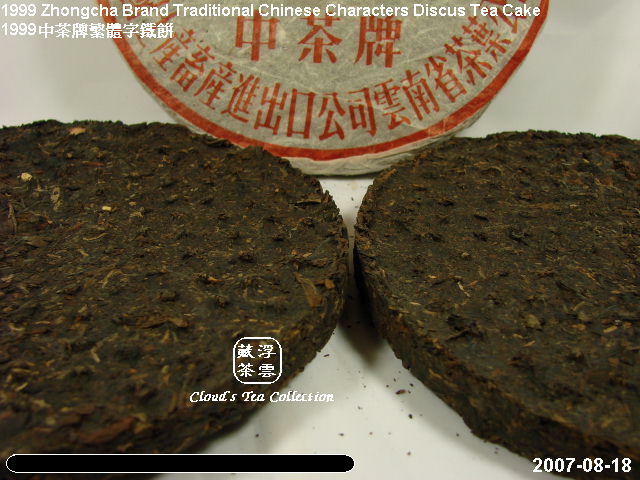 Those Puerh tea connoisseurs who had once tasted the well stored and aged "Seven-son Discus Tea Cake" loves that tea very much and had an unforgetable appreciation experience. By the same token, the Traditional Chinese Characters wrapping paper also lines up with these two different shapes of the tea cakes. Then, there are two combinations evolved. One is the normal tea cake with a SC wrapper and another one is a discus tea cake in a SC wrapper. In short, it means the "TC Tea Cake" (normal) and the "TC Discus Tea Cake". Correct! What I am going to introduce to you in this Internet article is the latter one, the "Zhongcha Brand Traditional Chinese Characters Discus Tea Cake" produced in 1999. Cloud always emphasizes an important Puerh concept, that is to say "the aged tea cakes come from the newly made tea cakes." In other words, if there are no today's newly made tea cakes and there will be no tomorrow's aged Puerh vintages. The well aged Puerh teas have their high prices nowadays. Is it merely the result from the speculation? Cloud has a different view. The price of well aged Puerh vintages simply just reflects the "supply and demand" of the Puerh tea market. 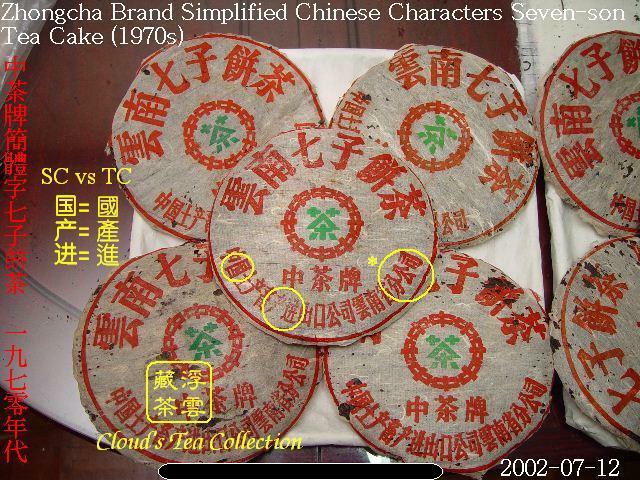 In the early 1990's, people did not know much about well aged Chinese Puerh tea, including those Hong Kong people, Taiwanese and people from the Mainland China. That meant a low demand of these Puerh vintages at that time. No matter how good the storage condition of a Puerh tea cake was, the customers were unwilling to pay for a high price for them because there were a lot of supply of the similar products in Hong Kong in the early 1990's. That is the reason why the Red Mark with 30 years of aging at that time just only costed people around a thousand Hong Kong dollar per piece (~US$128 equivalent, P.S. 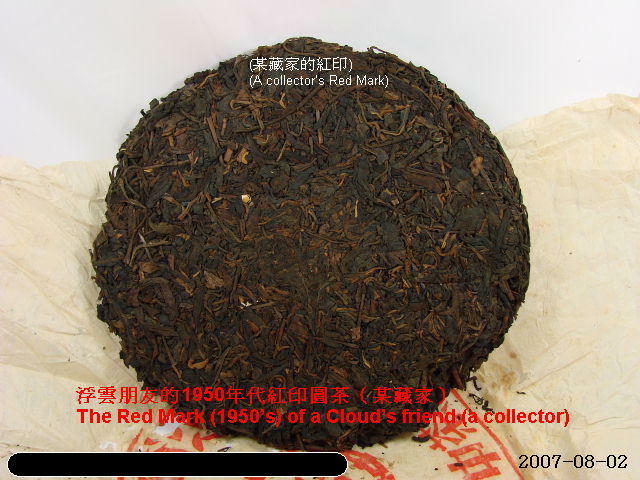 the current price of the Red Mark in 2007 is US$10,000 per tea cake). 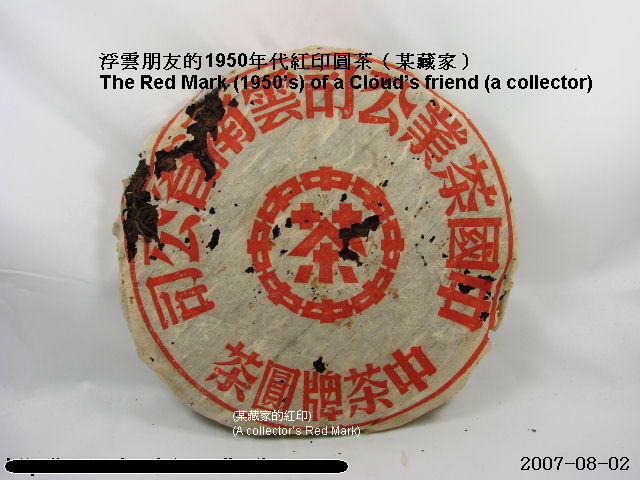 Even though, nowadays, the Red Mark with such unbelievable expensive price, there are still lots of millionaires from the Mainland China willing to have one in their home. Apart from these millionaires, it is the real fact that, in recent year, more and more people start to notice that well aged Puerh tea is extremely good. Once they have had a very nice cup of aged Puerh, they will be fascinated by the amazing liquor. How such an old stuff could offer such a great aroma, mellow taste, sweetness, smoothness and vivid tea broth which oolong tea or any other kinds of tea do not offer. This results in unlimited demands for the genuine well aged Puerh vintages, especially the great demands from the rich people in the Mainland China. They have money but they just don't have enough time to wait for the maturity of young Puerh. Therefore, they choose to buy the time of the others. This explains the reason why the selling prices of Puerh vintages (I emphasize, only the aged Puerh vintages) could have a solid twofold to threefold inflation without having any sign to depreciate in the recent Puerh tea falling market. This leads the well aged Puerh tea to an unaffordable level. However, this so-called "unaffordable" is actually not an issue to the rich. The real issue to the rich is that sometimes, even though, they are willing to pay, it is not easy to get them a well aged tea cake because it is no stock at all. From a novice's perspective, the next step is to find out and locate some potential young Puerh tea cakes not yet well known to the public so that one can buy enough quantity for their self-consumpution in the future at a relatively low price. 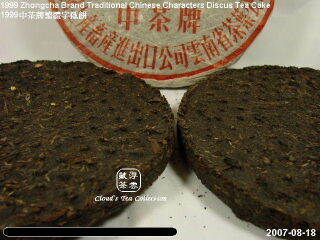 However, having known a good potential Puerh tea cake is not enough. If the selling price is too high, it is still untouchable. 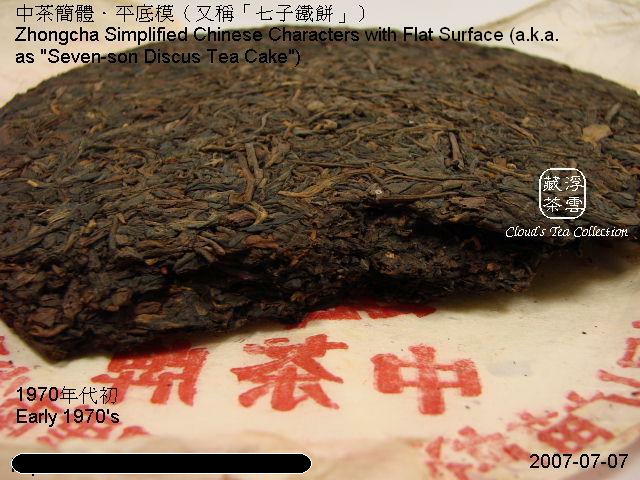 As a result, knowing a Puerh tea cake's C/P value is also a key to the Puerh's world. 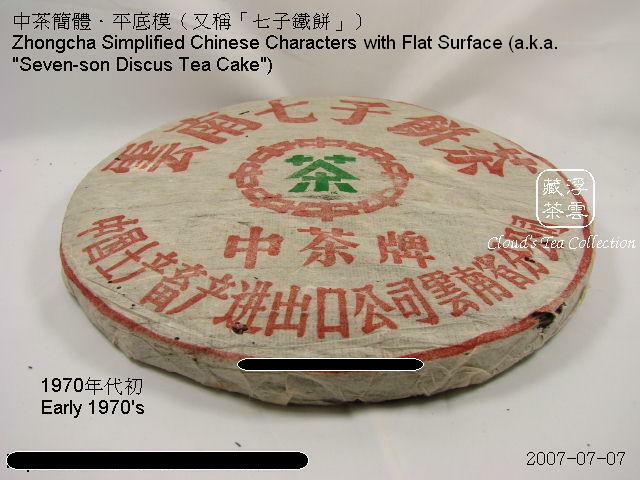 Sometimes, even though a well aged tea cake may cost one US$1,000 per piece, it may be a worth buying choice because it has been aging for more than 30 years. At least, the buyer does not have to wait further, just buy and brew. Let's review the Puerh history for the past 20 years. It is a fact that all the high price well aged Puerh tea pursued by the connoisseurs nowadays were once at a point sold at US$128 per piece in the past including the famous Songpin Hao, the Red Mark, the Blue Mark, the Yellow Mark and the Simplified Characters. It is because all these tea cakes were young at that stage, selling at such prices was a fair market value at that time. Besides, the low price of well aged Puerh tea in the past was also due to the low demand. Then, the next question is that when these tea cakes were sold at just US$128 per piece, had you have started your Puerh tea collections yet? If yes, would you have bought them when they were sold at such a price at that time? Good teas are always favorable to the Puerh connoisseurs. Whenever they encounter worth buying tea, the tea crazed will buy a substantial amount in order to secure their future consumption. 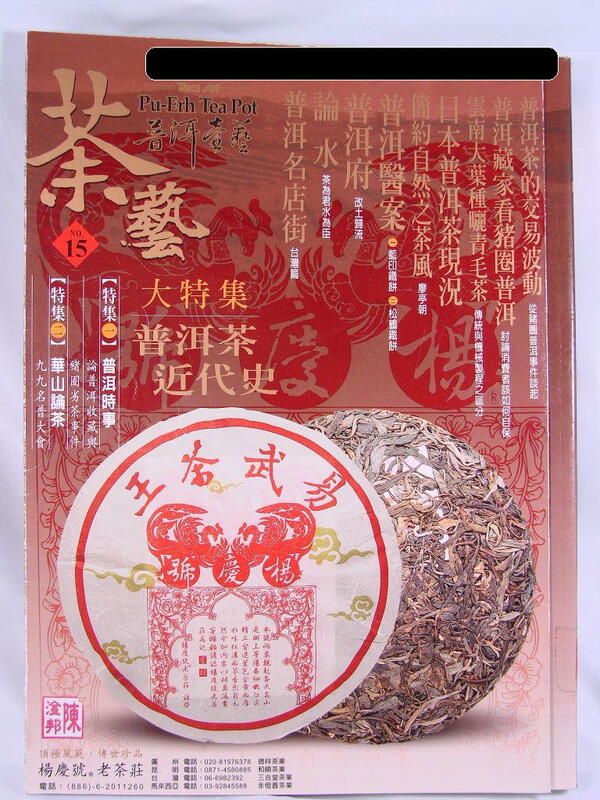 Puerh tea is a kind of very special tea that it will age and have a better taste next year. If they cannot finish a tea cake in a year, it will taste better next year. That's why people do not mind purchasing the quantity for the coming 10 years. This consumer philosophy will definitely lower down the stockpile of the tea vendors who will then unwilling to sell the remaining stocks and the selling price will go up. 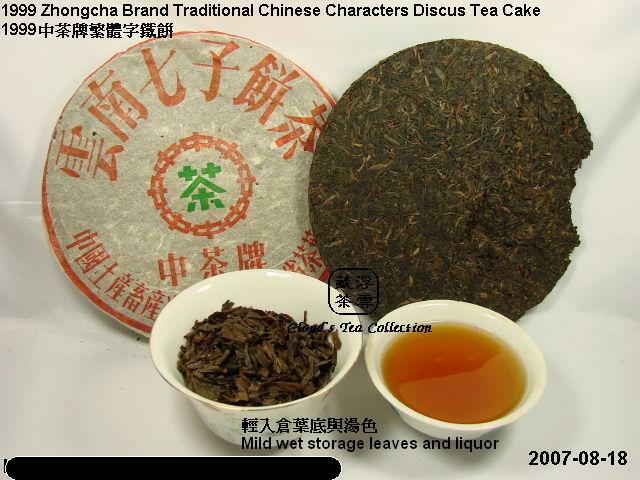 The 1999 Zhongcha Brand Traditional Chinese Characters Discus Tea Cake is the potential one to be the Puerh vintages in the next decade. It's time to pay attention to this tea if you can buy some around US$160 per piece. 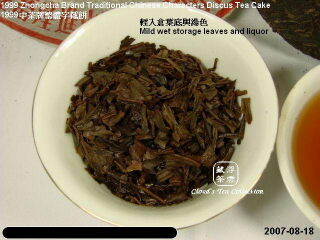 "1999 TC Discus was compressed from the traditional Xiaguan raw tea leaf materials. It shows the traditional Xiaguan style and taste. The slight aged taste started to emerge with its thick tea liquor. The overall performance of this tea could be felt from its aroma, tea broth, aftertaste and the tea sensation, quite abstract, right? Anyway, when I had a little sip of this tea, I could feel the liquor was not thin but really thick as if it were a cotton ball in my mouth, which was soft and spongy. The tea broth still had its mild astringency. Certainly, the astringency had reduced a lot and transformed into slight honey and sweet taste. The aroma lasted for quite a long time. The bitterness it had did not deter my desire to have another little cup of it. In fact, it was a sign of good tea with its strong enough intrinsic aging prerequisite. Because of its slight aged taste, the sensation changed very quickly in the month from the mild astringent jerkiness to its "Gan (甘)" aftertaste. Its fragrance, no matter where it's from, the liquor or brewed tea leaves, showed its obviousness and solidity. This was a typical Xiaguan aged tea aroma and taste. Within its strong and astringent taste, it still had its soft and pleasent sensation. I could say it was an additional bonus to connoisseurs when such a young tea could offer at its young age. Remember, it was just a 6 years old boy (in 2005). The aftertaste stated in my month for quite a long period of time. Wheneven I breathed out, I could feel the sweetness as if it were the same one from the orchid. Why did people love aged raw Puerh tea? I think this was the main reason. Although this tea had not yet completely aged and still had its astringent jerkiness with its slight aged aroma, without such a good potential prerequisite, how we could have a nice well aged Puerh vintage in the next decade. The remaining jerkiness was actaully the foundation for the future transformation." I am of the view that the 1999 TC Discus will have a great potential to be the Puerh vintages in the next decade. 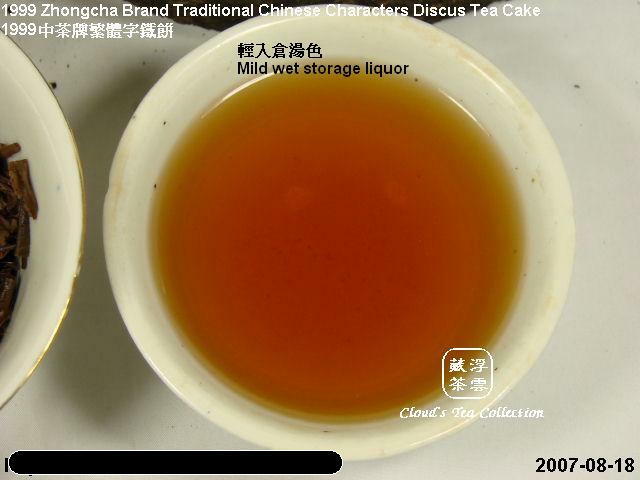 Although the 1999 TC Discus is still a young tea cake, which is less than 10 years of aging, it is quite amazing that it starts to have the Qi of aged tea. I do feel hot after several little cups of it. Besides, its aftertaste lasts for quite a while which is longer than my expectation. Generally speaking, immature young tea cakes are always astringent and not mellow enough for appreciation. This needs time to improve. Unfortunately, normally, a young Puerh tea cake needs 15 to 20 years to enter the preliminary appreciative stage. In short, the astringency cannot be removed naturally without 15 to 20 years, especially in the form of a discus shape. Therefore, Cloud was excited about the taste of the 1999 TC Discus becuase of its faster maturity (the mild wet storage version). The pleasent aftertaste and body feeling offer Cloud a peaceful spirituality after having several infusions. Cloud can feel the relaxation from the liquor. It is gorgeous and beautiful. Certainly, due to the time factor, the astringency has reduced a lot. Cloud realizes that the number "Seven" is an amazing number. Apart from the name of "Seven-son Tea Cake" which means seven tea cakes in a stack, around every seven years, the tea cake will have a great jump in its quality. Cloud doesn't know why, but it is quite incredible. "The 1999 TC Discus has a much aged taste than that of the last time. The color of tea broth is not as light as before and it becomes reddish orange. Many infusions, at least more than 15, is one of its characteristics. Needless to mention, its vividness, "Gan (甘)" aftertaste and its varieties between infusions are definitely above average. 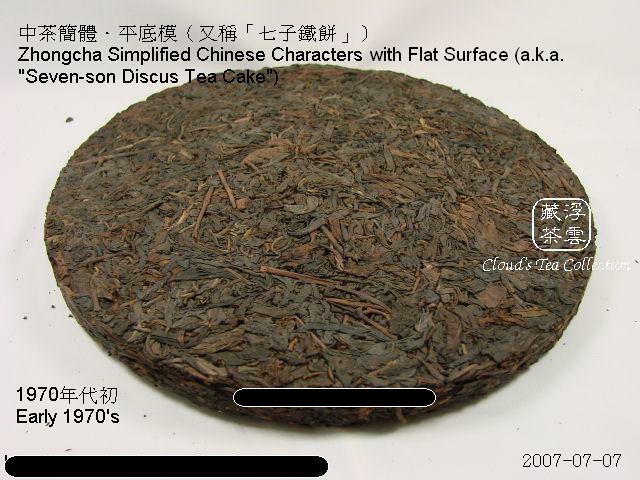 What Cloud has to say is the "Seven-son Discus Tea Cake" from the 1970's and the "1999 TC Discus" are both the series of Discus Tea Cake, which has the characteristics of "No Hollow", "Flat Surfact", "With Nails" and "Sharp Edge". 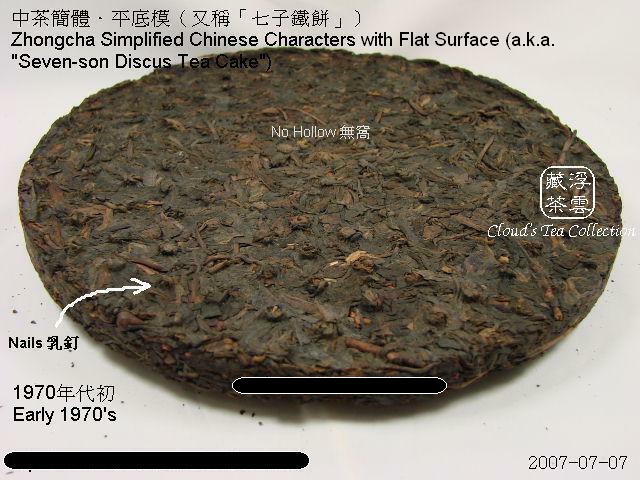 By comparing the taste and the tea leaves, Cloud has a feeling that the 1999 TC Discus is the heir of the 1970's "Seven-son Discus Tea Cake"." From photo A0350, it can be seen that the storage condition of the 1999 TC Discus was not stable, some are dry and some are wet. However, this matches its history because in the early 2000 Puerh tea was not as popular as today's situation. Tea vendors were pay much less attention to their storage. A slightly wet storaged condition, which was not fatal, was acceptable to them so that tea vendors were lazy to prevent or cure such a wet condition. 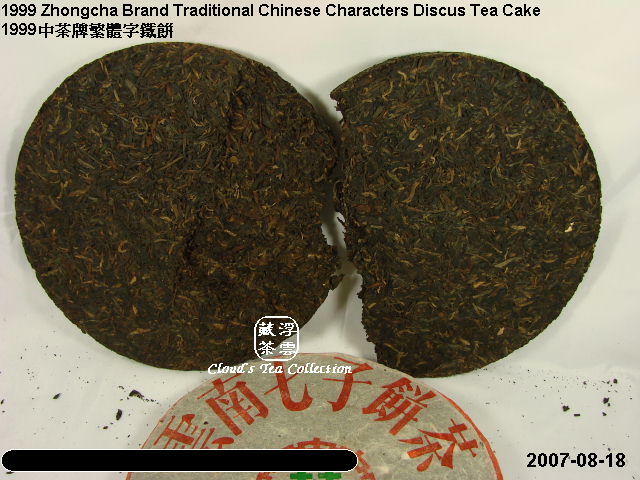 When Cloud purchased these tea cakes as my private tea collection, some were so dry (as you can see from photo A0350 marked as "Dry Storage") that they are now absolutely gorgeous and shiny and still with great astringent jerkiness which is technically still not my cup of tea in 2007. However, I will give them more time to age, I think, another 10 years is good enough. Some others are little wet (as you can see from photo A0358) that it has a medium brown color. Fortunately, the condition of the tea cake is still acceptable. After giving its appropriate flowing air for a while as the process of revitalization, it is still a very good Puerh to be appreciated, from our connoissurs' points of view. Taking photo A0358 as an example, it will be a quite nice Puerh vintage when it ages to 15 years of age in 2014, just 6 more years to go. By judging the brewed tea leaves, it has a little bit red color which was due to the higher water contents in the aging environment. Fortunately, the brewed tea leaves are still mainly green and no tea leaf is changed to totally dark. This shows that the 1999 TC Discus still has a lot of room for further aging. Therefore, both the mild wet storage and dry storage 1999 TC Discus are worth for collection because in 2014, we can have the slight wet one to be appreciated first while pending for another 5 years, we will have the drily stored to be mature. It seems that it is a great plan. As long as the wetly stored Puerh is not too wet, it has its own style for appreciation and appropriate for the consumption after 5 more years. Nevertheless, if you are prepared for storing Puerh tea for your consumption in the next decade, this is the one of the greatest tea you have to consider because by adding its years of age today (8 years) and another coming 10 years, you will have a 18 years aged Puerh vintage. Certainly, you can directly buy this tea in 2017. But I am sure that the price of it will definitely not today's price (around US$160 to US$190) per piece. Cloud must make a footnote here. If you feel that the 1999 TC Discus is not your cup of tea or its current price in 2007 is out of your budget, your response should be not to buy and take this tea out of your considering list forever. Cloud absolutely disagrees with people buying the tea they did not know much about. Some people purchasing tea is just becuase somebody told him/her to do so. It is dangerous because that cup of tea may not be your favorite in the future and this action may cost you a lot. As a tea lover, you should make up your mind and to ask "what is my cup of tea?". Expensive tea does not ncessarily mean that it is your cup of tea. Buying your own personal favorite tea should be the correct path to the world of Puerh. Only when tea lovers can consume Puerh tea in a more sensible way, the tea price will then turely reflects its quality and years of aging. 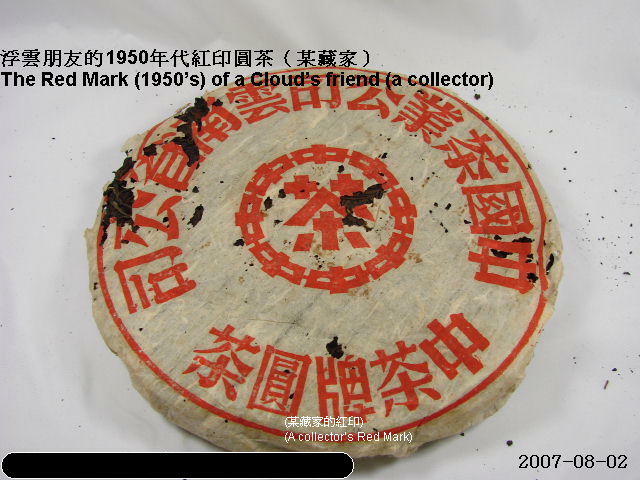 Cloud emphasizes that well aged Puerh vintages deserve for theirs high prices becuase time is invaluable. However, Puerh tea should not be speculated to an unaffordable and unreachable level, especially those newly made tea which has not yet started its aging. The above footnote is not new. 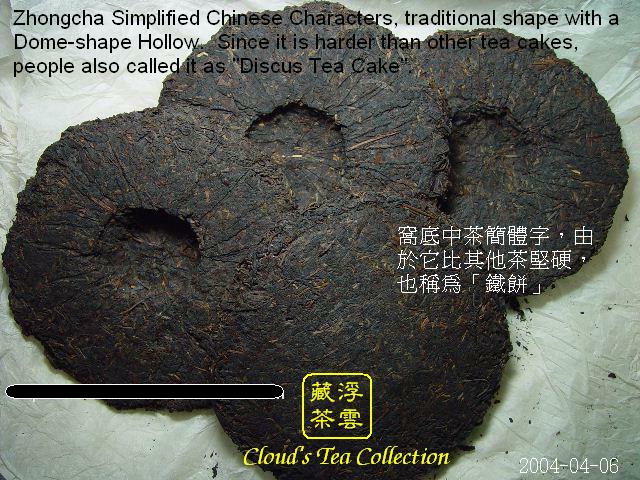 In 2003, when Cloud recommended Eighty-eight Raw Tea Cake (a.k.a. 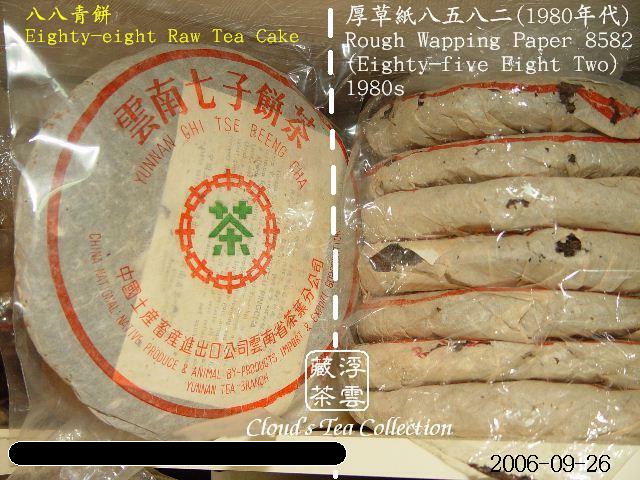 1988 Thin Wrapping Paper 7542 or 88 Qingbing)" in a Taiwanese website, Cloud made the same footnote that if one was of the view that a piece of Eighty-eight Raw Tea Cake was not worth for HK$672 (US$86.16), then one should not consider this tea anymore. 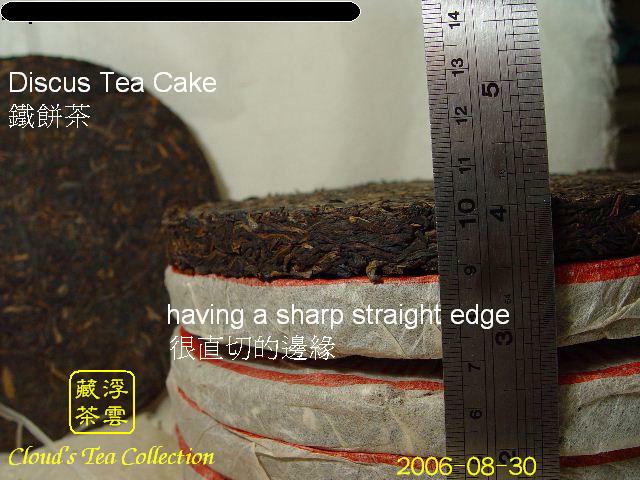 Even though a piece of Eighty-eight Raw Tea Cake costs HK$9,000 (US$1,153) in 2007, it does not really matter to the one who chose not to buy in 2003 because that tea is still not his/her cup of tea and had already been taken out of their considering list. The market price should not and does not affect the taste, right? Another point Cloud must emphasize is that appreciating real Puerh tea must be under a pressure-free environment, no matter whether the pressure is from your boss or your financial situation. This is the real spirituality of the Art of Tea. Sometimes, if Cloud is brewing Puerh casually, some loose-leaf ripe Puerh costing US$60/KG is really good enough. This rationale is more or less the same when you are considering to buy your own car. Some low price cars are still cars. They serve the same purpose of taking you to the destination. The difference between these cars and the high price cars (or sport cars) is just whether you enjoy the journey or not. Finding out the potential Puerh tea vintages is not a hard job for experienced Puerh tea lovers. However, a beginner may be confused when facing with the enormous newly made young tea cakes. 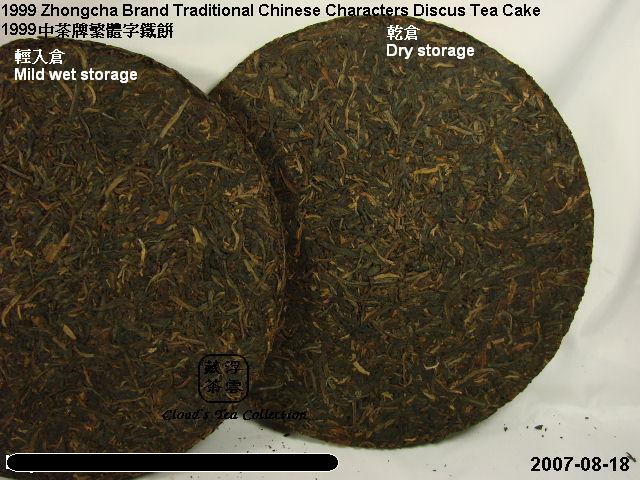 By the same token, as I mentioned in the previous paragraph that all the Puerh vintages were sold at a relatively low price when they were young. Actually, the same history is just about to happen. The current price of the 1999 TC Discus at this moment is about US$160 to US$200 per piece. By reference to its predicted price in the future and its quality, it is worth buying now. Even though the tag price US$200 is seemed to be a little bit higher than its fair market value, this little bit premium will be eliminated in 2008 because the tea will have a further aging development. However, the vendor may also adjust its price next year. Thus, whether it is an ideal moment to buy some is not the question of quality, but the issue of the financial situation of individuals. When this tea becomes delectable, the rich pursuers will directly purchase the tea without any hesitation. Then, the price will certainly go up like a rocket. In fact, it is quite easy for this tea to be priced over US$256 per piece in the near future. The costs of appreciating this tea will then be higher. However, I am not saying this is a must buy item. It is just a good tea cake which needs a thoughtful consideration. Some people can afford and some may not. If you have decided that this is not a worth buying item or an out-of-budget one, then you should never try to pursue this tea even though it may be more expensive later. Otherwise, this will contradict the rationale of hoarding tea yourself. 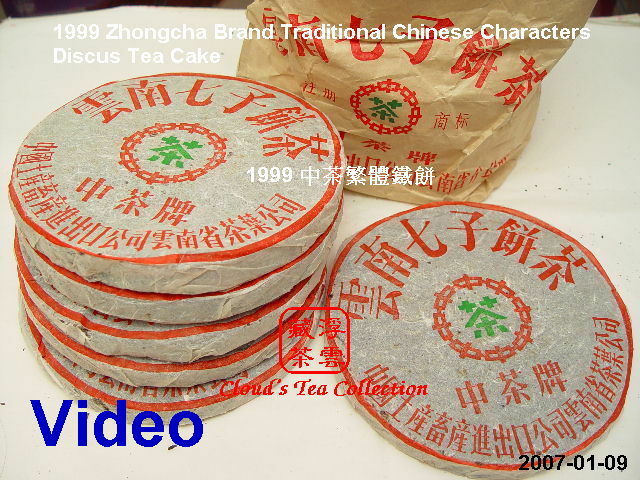 Firstly, even though it is just an ordinary regular tea cake produced in 1999, its quality is generally higher than that of some tea cakes manufactured in recent years. It is because the overall Puerh tea yield in the late 1990's was much lower than that of today. Secondly, the hallmark tea cakes of late 1990's, such as the "Green Big Tree" series, now costs over US$256 for a single piece. However, the 1999 TC Discus was from the same year but now is having a lower selling price. Is it just becuase it is a Xiaguan tea? 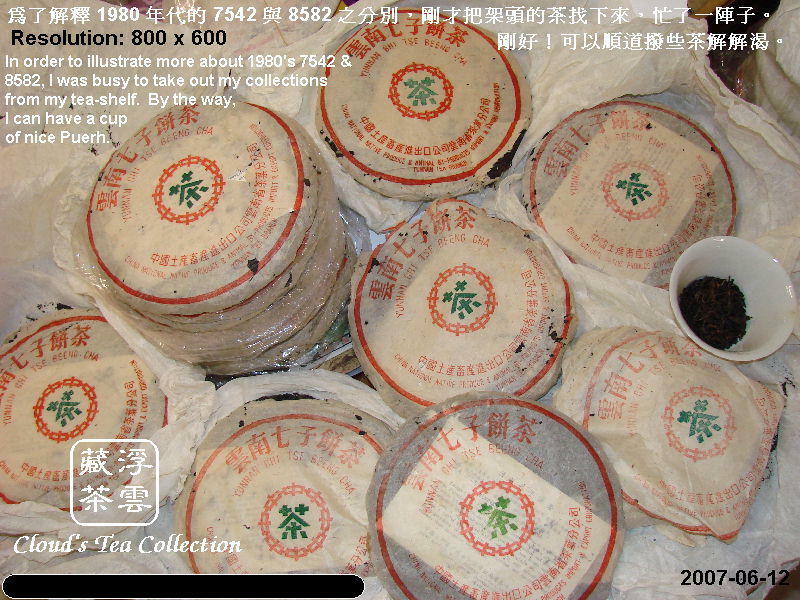 Thirdly, although the prices of newly made 2007 tea cakes dropped dramatically in the past few months, it was the expected results of those infant tea cakes after speculation. Antique Puerh Vintages, Masterpiece Puerh Vintages and those aged Puerh vintages were all limited editions at the year of production. Their qualities and market postitions of those aged tea cakes are truely affirmed by the market today. The price of the 1999 TC Discus not being adjusted upwards in 2007 may be due to the falling market. However, this in fact compresses and hides up the original inflation, which it should have had, of this tea. When the market becomes hot again, the price of this tea may then be unbelievable. Fourthly, the raw tea leaf materials in Yunnan is going upwards. Some newly made tea cakes with good aging ability may cost around US$30 per piece which is just a newborn tea. 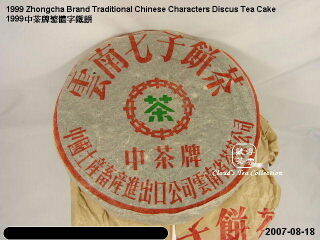 Is it more valuable to buy a tea cake with 9 years of aging by a higher price? The answer depends on what you think. Fifthly, when the tea ages over 10 years, other kinds of tea from the same production year such as the "Green Big Tree" will certainly not be US$256 per piece anymore. 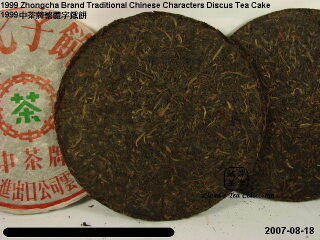 By the same token, the 1999 TC Discus will also not be the currect price because it will also be a 10-year tea cake. Sometimes, the rationale of hoarding tea is similar to the fate and destiny. Even though we may have hard time in some ocassions, as long as we work hard and no murmuring, we will definitely get through it and have a better future and tomorrow. Hoarding Puerh vintages is the same. Despite Cloud could not encounter those Antique Puerh Vintages in 1980's (at that time, Cloud was just a little kid) and was unable to buy a piece in such a low price, Cloud is still young and have time to store some more good Puerh tea vintages. Think carefully and you will notice that aged Puerh vintages come from those newly made young Puerh. Honestly speaking, without those tea men manufacturing young Puerh tea cakes 20 to 30 years ago, how can we have such great aged Puerh vintages for appreciation nowadays. From the moment Cloud decided to store his own Puerh tea cakes, those having great potential to be the Puerh vintages in the coming decades are the first choice such as the Simplified Characters and a series of Seven-son Tea Cakes from the 1980's. 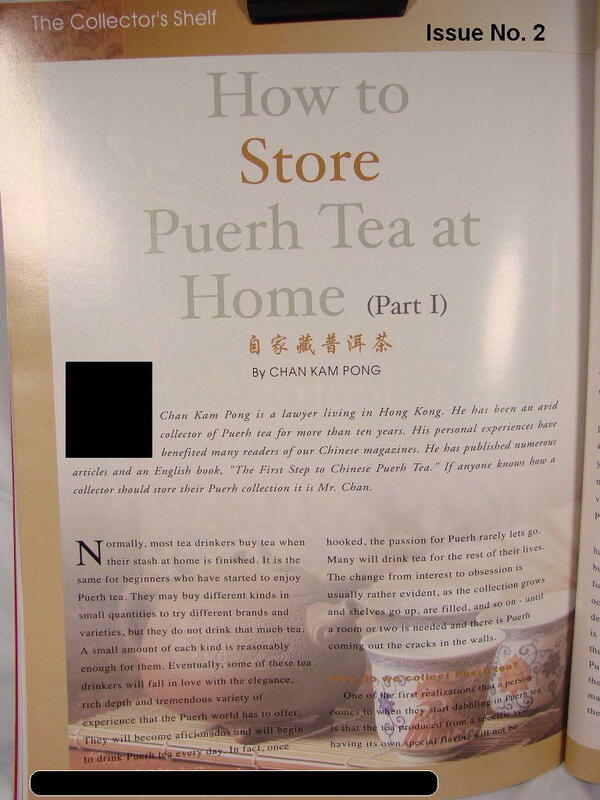 After years of experiece, as long as the storing environment is moderate enough (for "How to Store Puerh Tea at Home Part 1 and Part 2 ", you may refer to Issue No.2 and 3 of "The Art of Tea" Magazine or the Annexe of the hardback version "First Step to Chinese Puerh Tea" to be released in October 2007.). Cloud believes that those potential raw Puerh tea cakes with strong astringent jerkiness can be at one day delectable. But the point is, whether you are patient enough to wait for such a day?